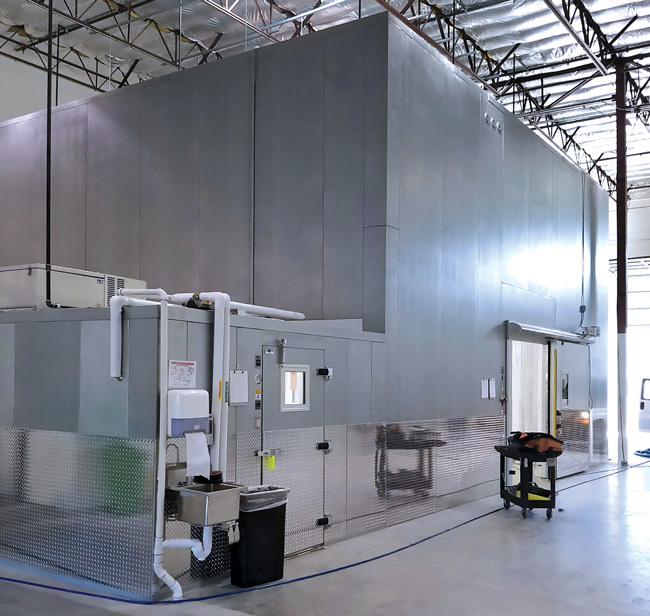 The actual size 58’8” x 33’7” x 20’0” high warehouse walk-in cooler/freezer combination pictured is one of two Thermo-Kool walk-ins which recently shipped to Giordano’s Distribution center in Henderson, Nevada. The uniquely designed warehouse walk- in exemplifies Thermo-Kool’s flexibility in design and capability of maximizing cold storage space by utilizing the DURATHANE high-density panel perimeter to manufacture in 1” panel increments. The strength and durability of Thermo-Kool’s panel design is a great fit for the project to ensure the quality and longevity on which both Giordano’s and Thermo-Kool have built their reputations. Both the warehouse walk-in cooler/freezer combination and the 11’4” x 33’7” x 7’6” high walk-in cooler have a white stucco galvanized interior with LED light fixtures in the ceilings which helps to maximize illumination, a significant attribute for the 20’ height of the warehouse walk-in cooler/freezer combination. All of the walk-in compartments were designed as floorless which is the ideal application to accommodate the rolling traffic in the warehouse cooler and freezer compartments. The 36” x 76” and 36” x 78” Thermo-Kool entrance doors which were provided in the coolers consist of three hinges, a 14” x 14” peep window with heated frame and glass, LED light fixtures and ” aluminum tread plate kickplate 48” high on the interior and exterior. Both the warehouse walk-in cooler and walk-in freezer have a 6’0” x 8’0” electric sliding door with ” aluminum kickplates 48” high on the interior and exterior, vinyl strip curtains, LED lights, and 14” x 24” peep windows. Additional accessories provided were temperature alarms for each compartment and ” treadplate wainscot 48” high on the exposed exterior for protection from moving product in and out of the walk-in compartments. The ceilings of the of the warehouse walk-in cooler and freezer were designed to be supported by Thermo-Kool’s exterior angle ceiling suspension system. Thermo-Kool Customer Account Representative, Erin Flynt worked on the project with Steve Wishon, Project Manager and Janice Dziuban, Senior Assistant Project Manager with Edward Don & Company, Woodridge, Illinois, and Thermo-Kool Marketing Agent, Joe Wagner with Cassidy’s Proline, Lombard, Illinois.